New generators use less fuel, burn cleaner, and produce more power than their predecessors. As the season nears, it’s a good time to assess any needs or shortcomings your boat might have. The engines were serviced and they’re purring like proverbial kittens. New props were installed and you managed not to ground them. The electronics are current, even the canvas looks brand new. But what about the generator? Like an insurance policy, or even a loyal deckhand, many of us take the generator for granted. It always kicks on when we need it and provides much-needed juice for the myriad appliances many boats now carry. Updating your boat’s generator can pay off in a number of ways. The latest and greatest models finally utilize electronic fuel injection to improve efficiency and reduce the output of carbon monoxide. A control pad makes for simple operation. Generator sizes are based on their output. The amount of kilowatts they produce is usually the number in the model name. Kohler is one of the manufacturers making low-CO generators, which reduce carbon monoxide emissions, making it safer and more comfortable to be aboard a boat while the generator is running. The Kohler uses throttle-body injection. Kohler has its own small-footprint diesel model gensets starting with the 490-pound, three-cylinder 6EKOD, which produces 6 kW and offers sophisticated functioning and touchscreen interface. It fits in a 31- by 21- by 22-inch envelope, which should save space in your engine compartment. The 9EKOZD is also powered by a three-cylinder diesel and produces 9 kW. It fits into a 34- by 21- by 22-inch space and weighs 548 pounds. Finally, the 11EKOZD is an 11-kW model based on a four-cylinder diesel engine, weighing in at 616 pounds. 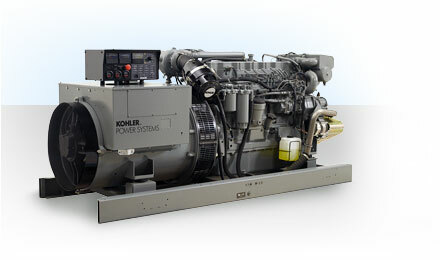 Each Kohler genset is available in 50- or 60-hertz models and comes with advanced controllers that provide trouble-free operation. The new touch-style control pad has power and start/stop buttons, a two-line, 12-character display, and a simpler setup process. There’s even a USB port for quick software installations and maintenance downloads. The controller has power management, a fuel primer, a hybrid voltage regulator, and an interface with SmartCraft instrumentation. If you’re wondering if you need a generator or you can still get by with an inverter, most experts say that if your electronic accessories require more than 3.5 kW, you need a generator. Add up the power requirements for each appliance you plan to run off the generator. Once you arrive at a total in kilowatt-hours, choose a generator rated to produce at least 20 percent more. Trying to go cheap with a genset rated too close to your total will cost you in the end. Your new generator will wear out quickly and you’ll wind up buying the correct size replacement unit sooner than should be necessary. Don’t go off the deep end in the other direction either. Using an oversize genset runs the unit at an insufficient load, which will cause it to operate inefficiently, which increases fuel consumption. A generator should run at least at 25-percent load with the ideal being 35 to 70 percent. Finally, if you like to take longer cruises, install a remote canister-style fuel-water separator in-line for your generator. Most gensets come with a small integral fuel-water separator, but the remote version can save you some headaches by preventing contaminants from getting to that smaller filter because it will clog quickly. Position the remote separator ahead of the motor in the hose routing and make it accessible so you can change the element or clean it out if it gets clogged.